Pedigree is often an indicator of quality and Merton Pride has an excellent one - it is related to the well-known English Williams pear, crossed with a Belgian variety of good repute called Glou Morceau. The result is undoubtedly one of the best quality English pears available, notable for its juicy buttery flesh. Be sure to pick the fruits whilst they are still fairly hard, and then ripen indoors. Please fill in the details below and we will let you know when Merton Pride pear trees are back in stock. Merton Pride is in flowering group 4. Merton Pride is a triploid variety and cannot pollinate other varieties. It needs to be pollinated by another tree of a different variety nearby. You can either plant a self-fertile variety (which will pollinate itself and the Merton Pride) or you can plant two pollination partners which must each be of different varieties and able to cross-pollinate each other as well as the Merton Pride. If you need further advice on this just get in touch. 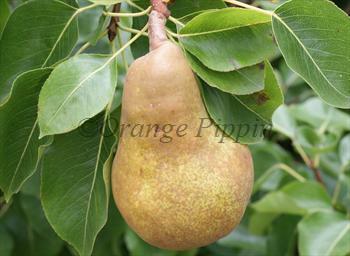 Merton Pride is a triploid variety - which is fairly unusual amongst pears. As with triploid apples, this is reflected in its fairly vigorous growth and above average disease resistance, but it is also unable to pollinate other pears. It needs another pear tree nearby for pollination, Conference is a good choice for this purpose. Although developed in England and with a part-English ancestry, Merton Pride has both the flavour and growing requirements of the top French pears. It is best grown in the south and east of England, in a warm sunny spot and on good soil - if you can provide these conditions then you should be rewarded with high quality pears. Merton Pride is quite difficult to propagate in the nursery and is usually only available on the more vigorous rootstocks. Developed in the 1940s at the famous John Innes Institute at Merton, Surrey, England. Merton Pride is a cross between Williams and Glou Morceau.